This delightful colourful heart makes a beautiful gift of love to inspire your special friends and will help encourage them as they go about their daily lives. 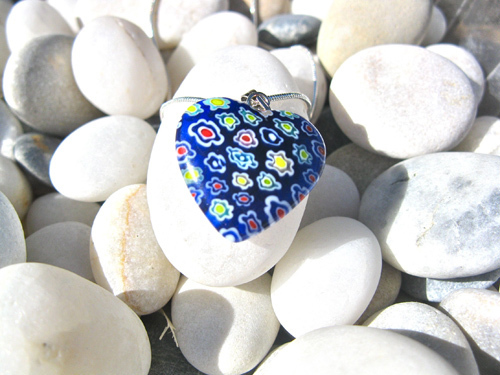 This glass heart is decorated with flowers right through its core, and when the light shines, it creates the most intense deep dark blue with the tiny flowers twinkling on top - truly inspirational. Detail: The heart measures approx 3.5cms long including the bail, and hangs on an 18" silver plated snake chain. More information about Love charm jewellery gifts from the heart . .
. . a wonderful present to show a loved-one or good friend how much you care. Ideal gift for a teenager, for affection, etc. Comes gift-wrapped, like all our presents - and we can print a personal message on your behalf.